Woop, there it is. Shiny brocade is hard to photograph. Just doing the thing where you put some big wefts through a few picks to draw everything in is not necessarily sufficient. Resign yourself to doing the test piece to figure out how wide you want the thing to be. Try different widths in the test piece. Corollary: I should document the width I most prefer for this pattern along with the threads used. Then if I decide to do another red/silver piece using this silk and this silver, I will have a rule of thumb for how wide it ought to be per X tablets. Listen to Nancy Spies and measure the band regularly, once you have established the width you want. Just because the pattern only has one border tablet, that doesn't mean the band should. Those funky, fringey loops on the original probably weren't funky fringe; they were probably passed through linen border warps that have not survived. Now how the [BEEP] do you expect to attach it to anything? I've tied the warp in a long loop around the tapestry loom. No worries about crushing the brocade now. I started by using two arm's lengths of silver thread, doubled into a one arm's length strand. That was too long - the thread got kinks in it and the silver came unwrapped in places. Now using one arm's length, doubled into a half arm's length strand. Taking the time to ensure the silver threads are laying nicely - parallel to each other, not crossing or twisting - really does seem to make a difference. When I start a new thread, the new and the old threads are coming in at the same shed, and it's bulking that pick up so some of the ground peeks through. I should probably start the new thread the pick before I end the old thread - wait, would that help, or would it just give me two bulky picks instead of one? ...I think it should work. Currently, I have four thread-ends crowded into the shed, and one set of threads brocading. New way would have new thread in the shed, old thread brocading, then old thread in the shed and new thread brocading. Should be smoother. Band 2, Birka grave 824. Pattern by Stella Anderson. Goodness gracious, that takes a ridiculously long time. And to think I want to make enough to wrap around my enormous melon. >.< This is notionally to go with the Birka outfit Team Storvik is making for Garb Wars (which isn't called Garb Wars this year, but I can't remember what it is called). Same silk as last time, but I'm using silver DMC #10 thread, doubled, as the brocading weft instead of metal strips. I cut a light cardboard rectangle and poked holes in it to serve as a warp separator. The warp threads got very messy looking and threatened to tangle, but amazingly everything pulled apart and got threaded onto cards pretty easily. Warping this time around went much faster. I started straight backstrapping, and right now it's tied to the tapestry loom, down at the bottom, then it goes up and over before getting tied to my belt. However, I'm fast approaching that point where I will have to take it in to get my hands closer to the area that needs work, and I'm not sure how to do that without knotting the brocaded section. Pins? I want to say it was 2-3hrs to weave that section, which is (rough estimate) 3 inches long by 1/2 inch wide. Just weave, not the set up. Whew. Most metal belt fittings are associated with leather belts, if any trace of organic matter remains. The single Anglo-Saxon exception of which I am aware is the St. John's Cricket Field strap end, which was attached to a thickly-woven linen band. Linen is stiffer and less springy than wool. This will become important in a moment. A weight at the end of a line creates a pendulum. In high school, you analyzed a pendulum with a massless length and a frictionless pivot. Well, this is a real-world pendulum. The belt end has a stiffness that damps out the pendulum motion. This is why your belt end does not swing back and forth forever. The stiffness of leather (and, I suspect, linen) is much greater than even a thickly-woven woolen band. 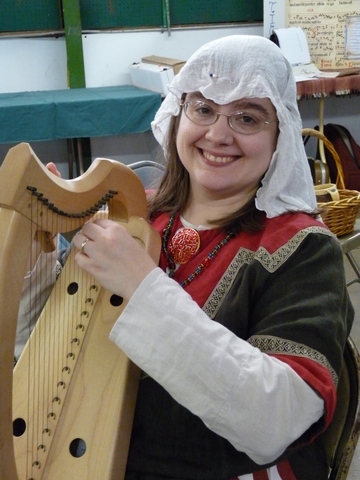 My wool belt has leapt forth to take swings at several people and Bruno (who is a harp). Some combination of the belt being too long and the wool being too soft means that it is not damped nearly enough. It flies out like a particularly ineffectual flail. I have so far been able to wrangle it, but I believe that I am seeing the reason why we don't have more belt hardware associated with textile belts. I've never been fully satisfied with "Because you don't have to have hardware to fasten a textile girdle," because there's a whole lot of fashion that exists but doesn't have to do anything. Especially in a high-status grave, why not mix luxury textile accessories with silver-gilt hardware? Because it'll put your eye out, evidently. As part of the run-up to Garb Wars, I did a little experiment in attaching tablet-woven trim to a garment. Many of the examples I have references to are to bands created as part of the fabric - starting bands, finishing bands, selvedge bands. Other bands were woven onto the finished fabric, with their weft thread passing through the cloth before passing back through the shed. I took an existing band and ran sewing thread through it, roughly following the weft. I wasn't trying to exactly hit every shed or pass of the weft. Out the other side, stab through fabric, back out along band weft. Out the free edge, turn and move down somewhat, back along a new weft. It made a really strong edge-to-edge connection. It was slow and a bit fiddly to do, but it seems like a very useful technique to have in the arsenal. As cool as the volva idea was (maybe for 2016? ), my husband is making noises about needing some new garb. Putting together a kit for him could be a nice KASF entry. A tunic at bare minimum. Probably tunic + trousers, or else embroidered tunic. He loves his ditty bag. I'm thinking a brocaded band a la Taplow, only use it for a bag strap instead of a sword belt. Use the general bag pattern from Harley MS.
Poetry of some sort. NOT (ONLY) IN PERFORMANCE, not after last year's laryngitis debacle. I'm surprised at how quickly the card weaving got done. Maybe... six or so hours? Over two days? Even working in wool again, this was so much easier than the belt. With four threads in each card, things were so much more stable. Cards didn't catch or tangle with each other; the shed cleared more easily; I didn't have to keep a hand on the pack at all times. And it's long, too - I could easily use this as a belt, and I don't exactly have a 24" waist. I used two sheets of brown paper bag in between wraps of warp around my lap-loom's warp-holder board; that helped my tension problems a lot, just as Mistresses Molly and Brianna promised. I was starting to get a liiiittle bit of looseness at the very end of things, but that was it. I switched from forward turning to backward turning when the cords got too tightly wound, not by any strict count of turns. The band does try and curl around those turning points; I'm going to consult my Collingwood to see if he has anything to say about it, but I suspect the answer may be "iron it." After picking bits of wool out of my lyre bridge again, I think, like Brian Boru, I'll leave the hairy side out. So I'm ready to make straps (and a tie) for the bag. Guesstimating 24 cards, threaded in all holes. I want to try continuous warping, so I was limited by "what do I have 4 balls of?" and the answer was "grey and red." Threading alternate colors, so when I offset all the evens by a quarter-turn and then weave with the full pack, I should get diagonal stripes (if they're all threaded the same way) or chevrons (if I do half S and half Z). I think I want to do stripes, just because so much of my previous weaving has been diamonds or chevrons. Will it spiral into a helix? Probably! My plan is to poke holes in the bag and thread the completed band through it in a continuous circuit to make "backpack" style straps. Won't have to worry about poking tiny holes for sewing, or having knotted straps pull through while I'm carrying it. For some reason, my brain figured out how to do a twill using card-weaving. Finally, those triangular weaving cards make sense! I did a quick test and it sort-of worked. I think the twill part was fine, but the piece needed edge stablization that I didn't give it. Phiala's String Page does sell triangular cards! The pack of cards wasn't very stable, as you might expect with only one hole threaded. I'd like to weave something 3-4" wide to use for winningas (leg wraps), and trying to manage that many floppy cards sounds nightmarish. But this could be a way to make "twill tape" in a very period way. I wonder if there's any evidence that this was done? It ended up coming together really quickly today. I finished the brocading with maybe 4" of broad plate left - there's about 7" of brocade in all. Then I wove a long piece of plain band. The width was pretty uncontrolled because I was so thrilled at being able to go quickly, I just blasted ahead. Also, knowing that the band will be covered by my veil, I wasn't so motivated to be persnickity. Since agates are used to burnish gold leaf, and I have some agate cabochons, I used the flat back of a big (2" long) stone to hold sections of the braid and flattened the brocade with a smaller stone. I also trimmed the brocading weft where pieces entered and exited the work. Figure 2: Large close-up of brocade, with flash blocked by thin white paper. It looks bad under strong light, but looks quite nice under normal room lighting. The reverse was very prickly and scratchy, even after it was flattened, so I cut a strip of white linen to cover the it. I meant for it to be a sort of a stand-alone felled seam, and it mostly is - just not as even as it could be. I was worried that the corners where the fabric was folded many times would press "hot spots" against my head but so far, no problem. Figure 3: Folded linen on reverse, sewn down with the same 60/2 burgundy silk that makes the band, so that it is invisible on the top. The longish stitches going across the band only sew a folded edge of linen to linen, and do not go through the band. I tied it on snugly, then used to center of the knot to position my two silver hooks. (I did have to open one of the hooks with pliers, just a little - they're meant to be used with a smaller gauge loop, I guess.) I used the attachment rings on the hooks like tiny annular brooches to pin them on and check fit. I fit it on bare head but over hair. I think that'll work with most of my veil configurations, or it will with a little adjustment. The band I've based this one on was found with small gold rings at either end. Given my thoughts about "eh, you can't see the unbrocaded band anyway," I wonder if - there was no more band? This find was a long strip, about 10" if I remember right, so plenty long to go across a forehead and disappear under a veil. After that - who cares? Save the silk! (If it was silk; a brownish thread survives but is too brittle to analyze.) Maybe a cord was tied from ring to ring? Or two cords, tied to each ring and then secured behind the head? Also, the well-folded (to finish the edges) linen reminded me of Arnegunde's "padded cuffs." And aren't there some Viking finds (Birka?) with padded bracelets of some kind? I wonder if this padding was a similar protective backing? All told - I am very very pleased with my new fillet. I've been wanting to make one for literally years. It's not perfect, but it looks very spiffy, and it reflects the light fantastically. Woooo! ADDENDUM: This picture of the Cologne princess fillet reconstruction shows the hook offset and... more than that isn't clear. I seem to recall reading that the fillet fastened with "a pair of silver hooks" - I just assumed they'd be in the center-back. (Ah, it was in Crowfoot and Hawkes, p. 79: "and the fillet seems to have been fixed at the back of the head by means of silver-wire hooks.") I wonder how they came up with that reconstruction? Maybe the brocade indicates the narrowing band, so overlapping it made sense? I'll see what my exhibit catalogue says, if anything. I seem to recall that Crowfoot and Hawkes had more detail on that piece! BONUS: This thesis appendix contains information on the textiles found with the Cologne 'princess.' One is described as a 12 cm x 12 cm piece "probably of silk, of a half-basket weave, turning into a twill-like weave; the spin analysis revealed that it was probably of unspun silk, the count of threads was 18/20 x2 threads per cm." (32). Sort of like my linen!